What is an Artist Statement? How important is price when buying art? Would you like me to help? This page covers conservation products and materials relevant to framing that are archival standard. A refined wax polish designed and formulated by the British Museum for the long term conservation and protection of museum exhibits. This product is now a universally respected standard conservation material because of its high quality and wide scope for use. Suitable for: Designed to protects items in museums. Freshens colours and imparts soft sheen. Protects surfaces eg paintings, metals, ivory, marble, metals, leather. 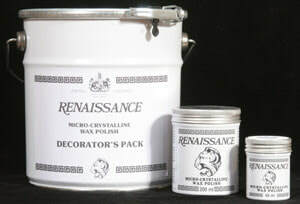 ​Product Review - Renaissance micro-crystalline wax polish on Making A Mark Reviews on 18 May 2009. When I started using natural wood frames for my artwork, I wanted to find a wax polish which would protect the frame while not staining it or damaging it in any way. Plus I really did NOT want any sort of 'high gloss' sheen. I came across Renaissance Micro-crystalline wax polish entirely by accident while browsing in Cornelissen's. However its label immediately suggested that this was the sort of product I'd been looking for. When I tried it out it did exactly what I wanted and I'm very pleased with it. I'd liken it to the very best face cream. You only need a small dab, it spreads wonderfully well, absorbs into the wood brilliantly, buffs up nicely and generally makes everything look a lot better! What I didn't realise is that it had been created by conservation technicians in the British Museum research laboratories in response to concerns about commercial waxes. Apparently the commercial waxes - based on beeswax and carnuba wax contained acids which spoilt finishes over time (in accelerated ageing tests). ​The product was developed in the 1950s and has been made since 1968 by London based firm Picreator who produce a variety of materials for professional conservation and restoration. L Cornelissen & Son - mail order - stocks all sizes (see Gilding Catalogue). 200 ml (£16.90 ex carriage). Not the cheapest supplier. Shepherds - online ordering - 200 ml can (£12.50 ex carriage). Also available in their shop. This website provides a compendium of resources about the art business for artists. It helps artists learn how to do better at being business-like, marketing and selling art and looking after their financial security. 1) Content and the law change all the time. all links lead to the most current and up to date information. 3) This website is free for you but not for me. ​Links to books are Amazon Affiliate links. Buying a book via this website means I get a very small payment which helps to fund and maintain this website. .I much appreciate any support your provide. Adverts are provided by Google AdSense - but the adverts do not mean I endorse the advertiser.